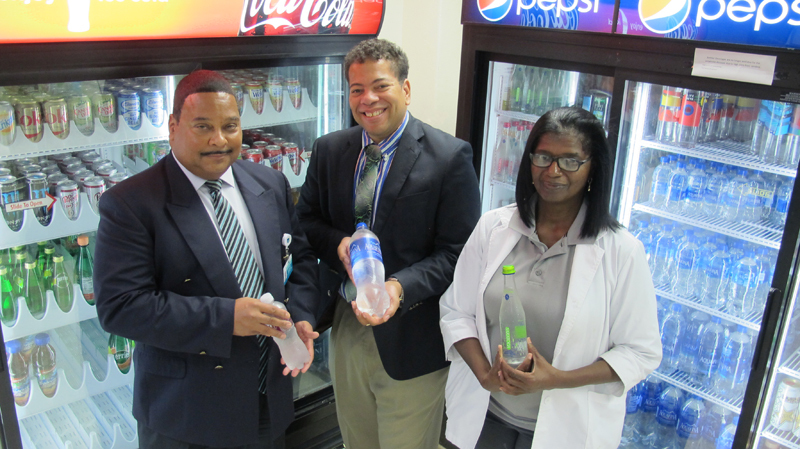 The Bermuda Hospitals Board [BHB] is taking the lead in helping its staff attain better health by cutting all drinks with high sugar content from its staff cafeterias. BHB’s Hotel Services Department has been phasing out its beverage offerings that contain more than 15 grams of sugar per serving. Waters and drinks that contain less than 15g sugar will remain in stock,” he added. Mr Pearman noted that contrary to the national trend of lower health insurance premium increases, the health insurance premiums for BHB’s employee plan rose 18 percent this year. This increase was not due to inflationary policies by Government or insurance companies. “The increase was a direct result of actual hospital and major medical claims by our staff exceeding the claims of peer populations by 30 percent,” he said. Chronic diseases were the primary driver of these claims. BHB’s Dietary Department revealed that the top five beverages sold in staff cafeterias at King Edward Memorial Hospital [KEMH] and the Mid-Atlantic Wellness Institute [MWI] from 1 April 2016 until 30 September 2017 contained a total of 3,070,778 grams of sugar. Most of the offending drinks are no longer available in the hospitals’ cafeterias. “By November first we will not have any overly sugary beverages available in our KEMH staff cafeteria or vending machines,” said BHB Director of Hotel Service Jerome Swainson. “By Christmas the same will be true at the Mid-Atlantic Wellness Institute,” he added. “Research shows that chronic diseases including cardiovascular disease, diabetes and hypertension can be significantly reduced by lifestyle choices,” said BHB Endocrinologist Dr Annabel Fountain. “Through this policy, BHB is creating an environment that supports and promotes healthier choices which will reduce the risk of developing these conditions,” she added. “Staff are rightfully disgruntled when health insurance premiums increase substantially like they did last year, but the rise was driven by expenditures for chronic disease related to our care,” said Mr Pearman. “Removing beverages with greater than 15 grams of sugar will increase staff awareness of the dangers related to high sugar diets. It will also make it easier for us to make better choices. It’s our hope this will result in a healthier workforce and keep health insurance rates at reasonable levels,” he added. Minister of Health Kim Wilson also threw her support behind BHB’s efforts. She said: “I have long been concerned about the high sugar content in what we consume. The Throne Speech committed to Government leading the way in wellness by encouraging its employees to make healthy choices. “BHB employees see far more clearly than the rest of us the negative health outcomes from obesity and diabetes so I’m delighted that our largest healthcare provider is leading by example. We, in Government, have promoted water only practices and policies in schools through the Healthy Schools Programme, and we are looking to re-introduce the Vending Machine Policy for Government premises, in order to improve healthy options. Pro Tip: 1 gram of sugar = 1 small white packet of sugar that you put in your coffee, tea, etc. SO when you drink a can of coke, you’re essentially drinking 40+ packets of sugar in ONE CAN! Exactly give me sugar over aspartame any day. No sense replacing sugar with chemicals that are going cost is even more in the long run. now if only they served something healthy at the cafeteria they’d be in business. Yes BHB time to move on, with three in four overweight or worse, what about it in the cafeteria – more healthy food.